To Cite: Jalili A. Preaxial Polydactyly of Foot, Report of a Rare Case, Shafa Ortho J. 2014 ; 1(4):e24623. Introduction: Polydactyly is the most common congenital anomaly of the forefoot. It can be isolated or associated with established genetic syndromes. Case Presentation: We presented a rare preaxial (medial) polydactyly of the foot. Because our patient reached maturity (24 years old), detailed bony anatomy of the forefoot could be evaluated. Radiographic examination showed a widened navicular bone, fusion of the first cuneiform with the first metatarsal, fusion of phalanges of the first ray, articulation of the second cuneiform with the second and third metatarsal, and cuboid with the fourth and the fifth ray. The first ray disarticulation was performed from the naviculocuneiform joint. Operation result was excellent according to published protocols. Conclusions: According to the Watanabe classification, our case was a tarsal medial (preaxial) foot polydactyly. Polydactyly is a relatively common condition with an incidence of 0.3 in Caucasian to 13.9 per 1000 live births in African American populations (1). It is characterized by supernumerary digits involving the hands, feet or both. The condition may be isolated or associated with established genetic syndromes (2). Thirty percent of nonsyndromic cases have a positive family history, and most are expressed as autosomal dominant with variable penetrance (3). Environmental and genetic factors have been reported in the etiology of polydactyly. GLI3 gene mutation and other loci on chromosomes 7q21- q34 and 19p13.2 have been defined for this anomaly (4, 5). Syndromes associated with polydactyly include Ellis-van Creveld syndrome, trisomy13, tibial hemimelia, and trisomy 21 (6, 7). Lateral ray or postaxial polydactyly is the most common foot polydactyly, occurring in 80% of cases, followed by medial or preaxial ones (15%) and the least frequent is central polydactyly (8, 9). Males and females are almost equally affected, and unilateral involvement is twice as common as bilateral involvement. 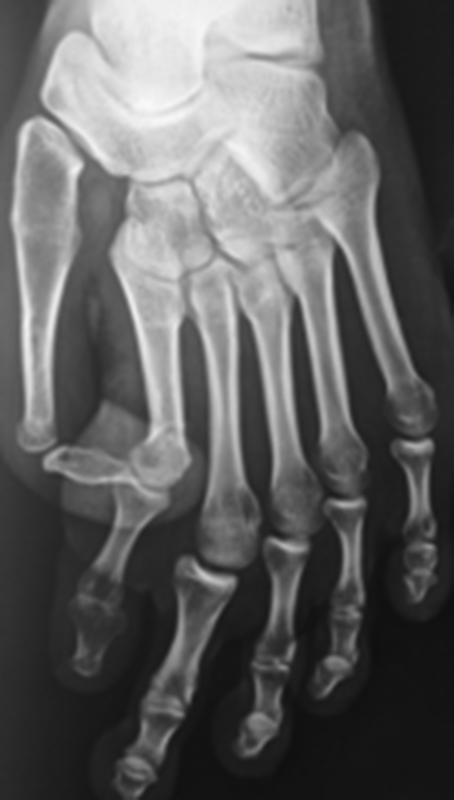 Associated abnormalities of metatarsal commonly occur in polydactyly (10). Concomitant polydactyly of the hand occurs in one third and syndactyly of toes in one fifth of cases (2). Polydactyly of the foot is less frequent and has a different genetic basis than hand polydactyly (11). We presented a rare case of foot preaxial polydactyly with its concomitant deformities and result of the surgical treatment. A 24-year-old male presented to our clinic with left foot polydactyly and a shoe wear problem (Figure 1). The first ray was deviated laterally from the tarsometatarsal joint. The second ray was hypoplastic, and the remaining four rays were normal. He had no family history of congenital anomalies. Both upper limbs and the contralateral lower limb had normal findings. Except for the foot polydactyly, examination of the left lower limb had normal results. Routine laboratory tests were in normal range. 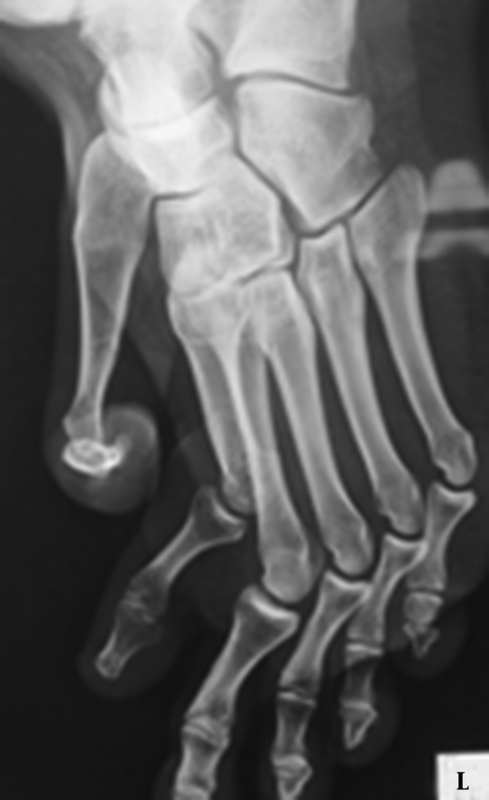 Radiographic examination revealed a widened navicular bone, fusion of the first cuneiform with the first metatarsal, fusion of phalanges of the first ray, articulation of the second cuneiform with the second and third metatarsal, and cuboid with the fourth and fifth rays (Figure 2 and 3). The first ray disarticulation was performed from the naviculocuneiform joint (Figure 4). Operation result was excellent and the patient was satisfied. Foot polydactyly may be isolated or associated with established genetic syndromes or other concomitant diseases. Adam et al. (12) observed clinical findings in 18 cases of preaxial polydactyly and diabetic embryopathy. They found that preaxial polydactyly of the foot, especially when associated with a segmentation anomaly of the spine and tibia hemimelia, is highly suggestive of diabetic embryopathy. They pointed out that a possible genetic predisposition interacting with teratologic effects of poor glycemic control in mothers can cause foot polydactyly. Different methods of classification have been proposed for foot polydactyly. Venn-Watson proposed a morphologic classification based upon the anatomic configuration of metatarsals and the duplicated bony parts (13). He defined six metatarsal variations with duplication of phalangeal segments: T-shaped, Y-shaped, widened fifth metatarsal head, complete fifth metatarsal duplication, and short block first metatarsal head (13). Blauth and Olason (14) classified each individual malformation longitudinally according to the level of bifurcation, such as distal phalangeal, middle phalangeal, proximal phalangeal, metatarsal, or tarsal. They assigned roman numbers according to the transverse position of polydactyly. Thumb and great toe are roman number I, index and the second toe roman number II, middle finger and toe number III, ring finger and toe number IV, little finger and toe number V.
Watanabe et al. (15) defined their morphologic classification upon ray involvement and level of duplication. They classified foot polydactyly into three major groups of medial, central and lateral, and each group is further subdivided into tarsal, metatarsal, proximal phalangeal and distal phalangeal subgroups. Other authors described their experience using this classification. Blauth and Olason defined only longitudinal (phalangeal, metatarsal, or tarsal) and transverse positions of polydactyly (ray I-V), but in addition to the longitudinal and transverse positions, deformity morphology was pointed out in Watanabe classification. Our case cannot be classified according to the Venn-Watson classification, but according to Watanab, Blauth and Olason it was the tarsal type. Tarsal type preaxial foot polydactyly is very rare. The Watanab classification is more useful for surgical planning. Operation is indicated to improve shoe fit and cosmetics. Surgery should be delayed until skeletal ossification has occurred in the affected ray, so that accurate anatomic assessment in surgery is possible. Clinical outcomes can be evaluated according to the format published by Phelps and Grogan (9). According to these criteria, the operation result in our case was excellent. We thank Pamela Waltl (Author AID in the Eastern Mediterranean) for improving the use of English in the manuscript.